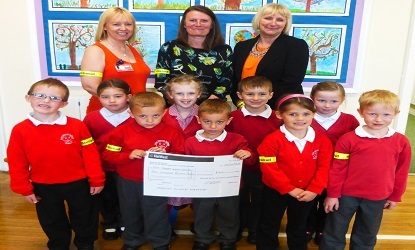 Stelrad Radiators’ in-house Community Forum is working with a local infant school in Mexborough, South Yorkshire to help keep the pupils safe on the roads and to help it in its aim to provide a defibrillator for the local community. As well as making a £200 donation to the schools fund for the defibrillator, they have donated reflective “snap bands” for all 120 children in the school, to help them stay safe on the way to and from school predominantly in the winter months when they are out and about in the dark. These went down a storm with the kids and should help them to stay safe and as importantly, make sure motorists can see them easily from a distance.